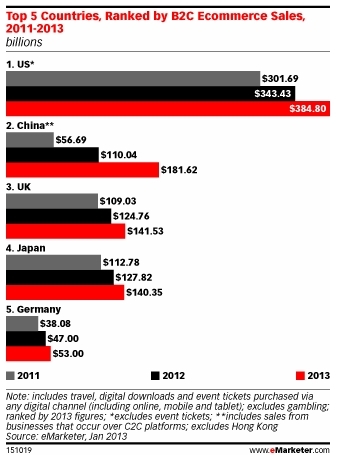 UK B2C e-commerce sales could reach $142 billion in 2013, which will position it just behind superpowers, USA and China, in eMarketer's rankings. The UK overtakes Japan after falling behind in 2011 and 2012. Germany was positioned two places below the UK in fifth. The country managed to hit sales of $47 billion in 2012 and it is estimated $53 billion might be generated by the end of this year. Germany is set to displace the UK when it comes to the number of digital buyers in 2013. eMarketer predicts that there’ll be 43 million Germans who will make a purchase through digital in 2013 compared to 37 million Brits. Moving northward, Scandinavian countries are some way off their westerly counterparts. In 2013 Sweden will have 4.5 million digital buyers, whilst Norway will only muster 2.4 million. For each country it’s close to half their populations. Where Norway does perform well, is in the average B2C e-commerce sales per digital buyer projections for 2013. The scarcely populated country is second in Western Europe with $2,796 and isn’t far off the UK’s figure of $3,878. Interestingly, eMarketer has UK B2C customers down as being some of the most valuable in the world when it comes to average sales. Only Australia comes close with its $3,802 forecast for this year. eMarketer’s research was collated using 1,100 data sets from over 130 research sources. It looked at more than 22 markets and six major regions before forming worldwide figures.